We just released a new patch for Heroes of the Storm that brings a new Hero, balance updates, and more to the Nexus! The free-to-play Hero rotation has been expanded from 10 to 14 Hero slots. The first 10 Hero rotation slots are available to all players at level 1. Rotation slots 11 - 14 still unlock at account levels 5, 7, 12, and 15, respectively. ​This change should allow players to meet Unranked Draft mode's 14 Hero minimum requirement more easily. However, Heroes must still reach level 5 in order to qualify for Ranked Play. 2017 Ranked Season 1 Has Begun! Once today’s patch arrives to the live version of Heroes of the Storm, Ranked Season 3 will officially come to a close, and 2017's First Season will begin! League standings will be reset and all players will need to play through 10 Placement Matches in order to receive their new starting rank for 2017 Season 1. As always, the matchmaking system’s certainty level in all players’ skill ratings will once again be loosened. This should make it a little easier to move up and down the rankings during initial matches this season. Players will receive their Season 3 rewards upon logging in to Heroes of the Storm after the patch becomes available in their home regions. Players who manage to brawl their way up through the leagues during 2017 Ranked Season 1 can claim a new portrait, mount, and gold rewards for their achievements in Hero and Team League. Click here to learn more about 2017 Season 1 and the rewards it has to offer. Players who don’t own Cho’gall can permanently unlock the two-headed ogre by completing a brand new Special Event Quest! Win 2 Games as Cho or Gall while partied with a player who owns Cho’gall to permanently unlock the Hero. Those who do not own Cho’gall may only complete this Quest once. However, they can still help as many other players unlock the hero as they wish. Since his activation, Probius has always wanted to prove himself. He may be small, but he made a big difference by warping in a critical pylon during the retaking of Aiur. 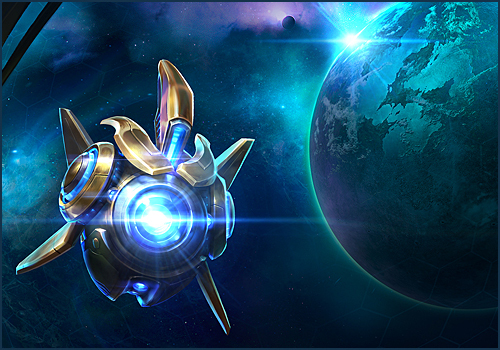 As the bravest of probes, Probius is eager to fulfill his purpose in the Nexus. Activate to gain an additional 60% Movement Speed for 5 seconds. Taking damage ends this effect early. Passive: Probius moves 10% faster by hovering over the ground. Warp in a Pylon that generates a Power Field and grants vision of the surrounding area. Probius regenerates Mana rapidly while inside the Power Field. Up to 2 Pylons can exist at once. Fire a burst of energy forward, dealing damage to all enemies it passes through. Firing through the center of a Warp Rift will cause it to explode, dealing additional damage to enemies in an area. Open an unstable Warp Rift at the target location that takes 1.25 seconds to arm and then slows enemies within its area of effect by 20%. Lasts 9 seconds. Armed Warp Rifts explode when hit by a Disruption Pulse, dealing damage to nearby enemies. Warp in a Photon Cannon that attacks enemies within its radius once per second. Lasts 11 seconds. Must be placed within a Pylon’s Power Field. Existing Photon Cannons will deactivate if they are no longer powered by a Pylon. For the next 10 seconds, Pylon Power Fields increase in size and Pylons will attack enemies within them. Passive: Pylons gain a permanent Shields equal to 50% of their maximum Health. Project a barrier of negative energy in the target direction that lasts 4 seconds. Enemies who touch the barrier take damage and are slowed by 80% for as long as they remain in contact with it. Ability Power debuff effects will now display an effect on Hero health bars. Elemental Stag – Awarded for reaching Platinum or above in Hero League or Bronze or above in Team League during Ranked Season 3. Epic Elemental Stag – Awarded for reaching Master League or above in Hero or Team League during Ranked Season 3. If a matchmaking queue is interrupted while the Heroes client is minimized, or not the focus window, the player will now be notified in the task bar. The color of the ring that appears under the player’s Hero has been changed from yellow to green. Today’s patch introduces the Party Frames panel to the in-game user interface, which makes a ton of information about your allies and enemies more readily available than ever before. The center area of the panel that contains Team Levels, XP, and the game timer, is now more compact and has received additional polish. A Talent tier indicator has been added to each team’s XP bar that blinks on levels that precede the next Talent tier (3, 6, 9, etc.). If one team gains a Talent tier over the other, that team’s level will be engulfed in flames to signify their Talent advantage. On Fire Effects Have Returned! Party Frames: Players who are On Fire will have their Hero Portraits in the Party Frames panel engulfed in fiery visual effects for all to see. Stats Screen: Embers will highlight the individual stats that contribute to a player’s On Fire status in the Stats tab on the in-game Score Screen. Hero Portrait: Players who are On Fire will see their Hero Portrait in the bottom-left catch fire. There are 2 different levels of On Fire effects. The better a player performs compared to all other 9 players in a match, the more intense their flames will become. While only 3 players can be On Fire at any one time, the game is constantly re-evaluating all players in the match. On Fire effects can swap among players regularly based on their current performance. This status will be lost on death, following a period of inactivity, or if another player’s performance surpasses those who are currently On Fire. When players score kills a notification will now appear on the left side of the screen along with your team’s kill streak timer. When a player scores additional kills, the Kill Feed notification will stack the portraits of slain enemies and reset the timer. The Hero Portrait in the lower-left corner, as well as Health, Mana, and buff bars, and even Ability hotbars have all received new art. The Stats, Talents, and Death Recap tabs on the in-game Score Screen have received significant visual updates. On-screen Killstreak callouts have received updated visual effects, and will increase in intensity as a player’s takedown count rises. You can find more information on the new User Interface changes in our blog. Several Heroes have received new descriptions in the Hero Select screen. Developer Comment: With the release of Single Lane Brawls, we've always wanted to try various forms of Hero selection to create interesting gameplay. We know there are avid fans of the completely Random Hero selection (aka ARAM), so that's how we initially released these Brawls. However, over time, we've also received feedback that a truly Random Hero selection can lead to widely imbalanced team comps, which can contribute towards a frustrating play experience. For example, we've seen some matches where one team has 4 Warriors and is unable to effectively fight against a heavy Assassin comp. Combined with the potential for longer games, we think Shuffle Pick may offer your team a better play experience by applying some balance options through Role and Hero Selection. As always, our endeavor is to create the best gameplay experiences for our players so please continue to provide feedback to us on whether or not this change improved your Brawl experience. Developer Comment: We love the gameplay around bushes, but feel some maps--and in particular certain lane transitions--have too many bushes for players to negotiate. We are starting to cull some bushes starting with Sky Temple. While this change is small, we are happy with its impact on the map in our internal testing and want to see how this impacts the game as we look to make similar adjustments. While active Gall deals 25% more damage. Effect is removed if Cho activates Ogre Hide. Increase the Move Speed duration of Shove by .5 seconds. While active, Basic Attacks from Cho increase the duration of the Movement Speed bonus by an additional 1 second. Basic Attacks by Cho reduce the cooldown of Shove by 1 second. Quest: Damaging an enemy Hero with Runic Blast permanently increases its damage by 5. Reward: After damaging 20 enemy Heroes, increase the range and speed of Rune Bomb by 20%. Detonating Runic Blast leaves a damaging field on the ground, dealing 180 damage over 3 seconds. The third bounce of Dread Bomb deals 100% bonus damage to non-Heroic units. You can activate Dread Bomb again to reverse the last bounce. Every subsequent hit of Shadowflame on an enemy Hero deals 8% more damage, up to a 40% bonus. These bonuses are lost after 4 seconds. Quest: Hitting enemy Heroes affected by Consuming Blaze with Shadowflame lowers the cooldown of Shadowflame by 1 second. Reward: After doing this 20 times, permanently lower the cooldown of Shadowflame by 1 second. Gall’s Basic Abilities cooldown 75% faster for 5 seconds after Cho activates Ogre Hide. Increase the size and damage of each Dread Orb bounce by 25%. Shadowflame deals additional damage equal to 2% of a Heroes’ Maximum Health. Shadowflame slows enemy Heroes by 10% for 4 seconds. This effect can stack up to 3 times. Enemies hit by Dread Orb are stunned for .5 seconds. Enemy Heroes hit by Runic Blast are silenced for 1.25 seconds. When Cho dies, you gain the effects of Ogre Rage and can continue casting Basic Abilities for 10 seconds. Twisting Nether can now teleport Cho a short distance before it begins casting. Takedowns permanently increase the damage bonus of Ogre Rage by 2%. Developer Comment: When we were first told about the new event “Two Heads are Better Than One,” we immediately set to work on giving Cho’gall’s talent trees a much-needed face-lift. A lot of our Warriors were getting Armor updates in this patch, and originally Cho’gall was no exception. After playing with a generic form of it internally, we realized we had a once-in-a-Nexus opportunity to do something very different and seized the moment. The foundation of the Cho’gall rework revolves around their new Traits, Ogre Hide and Ogre Rage, which are the keys to success with the Hero. The destructive potential of Cho’gall should be greater than ever, but you will have to make sure both heads are working together in order to maximize your damage output while keeping yourself alive long enough to keep doing it. Developer Comment: I’m not exactly sure where this Goblin keeps getting the hoards of gold he needs to bribe the design team, but sure enough, he’s done it again. These changes started off as quality-of-life fixes, but eventually evolved into something of a minor rework. Overall, we tried to even out the power-level of a couple talent tiers (including his Heroics), while also bringing in a bunch of baseline changes in order to make him feel a bit more user-friendly. We realize his win rate is above average in certain MMR brackets (and game modes), and that this may be viewed as a substantial buff to him. However, we felt it was important to bring these changes to our players and are prepared to act quickly if any tweaks are needed. Developer Comment: We’re currently doing a pass on our Warriors, and want to better separate those intended to be able to solo tank for their team from those who are better identified as “bruisers.” With Armor coming into the game, we also saw an opportunity to make our Warriors have unique roles for their team so that the strongest or most survivable few weren’t identified and always favored regardless of the enemy team composition. In this patch, we’ve taken a pass at both Arthas and Anub’arak to better embrace their roles as solo Warriors for their team. They have both received significant changes, largely with the theme of adding control and/or survivability to their kits at the expense of damage. While we know that players enjoy putting out that DPS, we think that moving them away from damage-heavy roles is a healthier direction for the game, and should make the decision of which Warrior to bring to a team more meaningful. We’re also hoping that this direction helps push against the trend of it being the “correct” choice to bring multiple Warriors to a team because some can bring both CC and survivability while also doing almost as much damage as our Assassins. Cooldown reduced from 16 to 12 seconds. Targets hit by Burrow Charge have their Movement Speed slowed by 25% for 2.5 seconds. Every 8 seconds, gain 30 Spell Armor against the next Ability and subsequent Abilities cast against you for 1.5 seconds. When you cast Burrow Charge, gain a shield for 5 seconds. Attacking a Hero that is slowed, rooted, or stunned increases your Basic Attack damage by 70% for 3 seconds. Enemy Heroes hit by Burrow Charge have their Spell Power reduced by 50% for 4 seconds. Activate to gain 60 Spell Armor for 5 seconds. Developer Comment: Anub’arak has received some baseline changes and talent tweaks to embrace his role as an anti-caster Warrior. New additions to his kit include: a lower cooldown and slowing Burrow Charge, a buff to his Harden Carapace shield amount, and some buffs to his Beetle build. Understandably, some players may be wondering why we lowered his Spell Armor when we want him to be an anti-caster. We felt that 25 base Spell Armor was a little too powerful in terms of countering casters because they have no real options to deal with it when it is a baseline hero stat. By giving him these changes, we’re hoping to make him a more well-rounded Warrior who still fills a niche that didn’t exist in our game before his addition. Damage lowered from 26 to 20. Now slows enemy movement speed and attack speed by 10% per second, up to 40%. This now stacks over 4 seconds instead of 5. If Arthas is Stunned or Silenced, he will not be able to toggle Frozen Tempest on or off, but if it is active it will persist for the duration of the Stun or Silence. !Quest: Root 5 heroes to reduce the cooldown of Howling Blast by 2 seconds. !Quest: After rooting 10 heroes, increase Howling Blast's range by 30%. Quest: After rooting 20 heroes, Howling Blast roots enemies on its path. Every 5 seconds, reduce the next Hero Basic Attack by 60%. Stores up to 3 charges. !Quest: After hitting enemy Heroes 150 times with Frozen Tempest, the Movement and Attack Speed slows of Frozen Tempest last for an additional 1.5 seconds against enemy Heroes. Increase Arthas’ attack speed by 3% each time an enemy Hero is hit by Frozen Tempest for 1.5 seconds, stacking up to 60%. Increase the range bonus on Death Coil from 25 to 30%. Increase the cooldown reduction from 2 to 3 seconds. Bonus healing now applies to self-casting Death Coil. Bonus healing reduced from 100 to 50%. Enemy heroes rooted by Howling Blast have their Armor reduced by 15 for 4 seconds. Slow increased from 40 to 50%. Frozen Tempest does 12.5% increased damage per second to enemies, up to 50% bonus damage (over 4 seconds). Now also affects the healing of Death Coil. No longer provides 100 Spell Armor. Arthas now takes 0 damage from Spells instead and heals for 25% of the damage prevented. Developer Comment: Arthas has long walked the line between being a bruiser and a tank, though we always intended him to be more of a tank as opposed to a bruiser. With Armor coming into the game, we saw the opportunity to really embrace him being that slow-approach-of-death that he encapsulated so well in Wrath of the Lich King. Arthas’s crowd control capability and survivability have been significantly increased in this rework. Now he should really shine as the Warrior to bring to battle if the enemy team has multiple melee Heroes, or just a lot of Heroes who are heavily dependent on their auto-attacks. His damage has been reduced to compensate for the extra control he’s getting in team fights. Since he won’t put out damage as quickly as he did before, his ability to kill enemies will greatly rely on how long he can keep them trapped inside his Frozen Tempest. Once they’re in the Tempest, it will be very difficult for them to escape without enhanced mobility. Cooldown reduced from 13 to 12 seconds. Reduced full charge up duration from 8 to 4 seconds. Times out after 5 seconds. Ignite all nearby enemies for 5 seconds, dealing 30 damage per second and instantly healing Cho for 30 Health per target hit. Attacks against ignited Heroes reapply the debuff (instant heal + refresh dot duration). Rune Bomb now continues its full path regardless of when or if Gall decides to detonate it. While active Cho gains 25 Armor. Effect is removed if Gall activates Ogre Rage. Consuming Blaze’s heal is increased by 150% against Heroic targets. Increase all healing received by Cho by 15% while Ogre Hide is active. Basic Attacks against Heroes decrease the Cooldown of both your and Gall’s Heroic Abilities by .5 seconds. Each consecutive Basic Attack against an enemy Hero deals 20% more damage. Up to a 60% bonus. This bonus lasts 5 seconds or until a different unit is attacked. If Surging Dash hits an enemy Hero, it also deals 7% of their max health in damage. Each enemy Hero hit reduces the cooldown of Surging Fist by 4 seconds. Reduce the cooldown of Consuming Blaze by 3 seconds. Basic Attacks against Heroes reduce the cooldown of Consuming Blaze by an additional 1 second. Cho’s Health Regeneration is increased by 200% while Ogre Rage is active. Gall’s Runic Blast reduces the cooldown of Rune Bomb by 1 second for every enemy hit. This bonus is doubled against Heroes. Gain 75% attack speed for 5 seconds after using Surging Fist. If cast while Ogre Rage is active, instantly swap to Ogre Hide. Cho gains 150 Health per second and is unstoppable while Surging Dash is channeled. Every takedown permanently increases the Armor of Ogre Hide by 2. Developer Comment: See comments for Gall. A number of typos and tooltip errors have been corrected across several aspects of the game. Kerrigan: The Countess Kerrigan skin now plays animations while Maelstrom is active. Kharazim: There is no longer a pop in the Air Ally’s animations. Nazeebo: Zombie Wall zombies will no longer create holes in the terrain when they die after choosing the Dead Rush talent. Cursed Hollow: Fixed a rare issue that could fail to provide players with vision of an active Raven Lord Tribute. Try Mode: Destroying the opposing Fort will now correctly despawn Misha when Rexxar is set as the enemy Hero. Try Mode: Toggle Cooldowns will now correctly reset Diablo’s Lightning Breath cooldown. Chen: Silence effects will no longer cause Purifying Brew to go on cooldown while Chen is Unstoppable during Wandering Keg. Dehaka: Becoming targeted by Kharazim’s Divine Palm while affected by Dehaka's Contagion Talent will no longer cause Isolation’s model to persist indefinitely above the target. E.T.C: Echo Pedal will now correctly deal damage to Doubloon Chests on Blackheart's Bay. Kharazim: Fixed an issue that prevented shift-queuing Radiant Dash casts to allied Heroes. Gul'dan: Drain Life can now be properly cast when Gul’dan has 0 mana. Gul'dan: Fixed an issue that could cause Ruinous Affliction’s damage bonus to be applied on Echoed Corruption’s fourth consecutive strike against a target, rather than the third. Malfurion: Learning Lunar Shower will no longer cause portions of Druid of the Flame Malfurion’s Moonfire visual effects to fail to generate. Medivh: Entering Raven Form should no longer clear shift-queued Movement commands. Nazeebo: The targeting indicator for Plague of Toads will now visually increase in size after learning Thing of the Deep. Ragnaros: Fixed an issue in which Empower Sulfuras would not benefit from Hand of Ragnaros when killing a secondary Heroic target. Ragnaros: Casting a displacement Ability that pushes Ragnaros out of channeling range for Molten Core will no longer cause Ragnaros to become unresponsive. Rexxar: Misha will no longer ignore orders to use a Healing Fountain when Rexxar is only missing Mana. Rexxar: Fixed an issue causing Spirit Swoop to deal bonus damage to Mercenaries after learning Bird of Prey. Samuro: Critical Strike's cooldown will no longer be paused while Samuro is dead. Samuro: After learning Illusion Master, selecting a Mirror Image just as it dies will now correctly reselect the real Samuro. Stitches: Casting Devour will no longer cause floating Talent Quest progress icons to appear before Stitches learns Savor the Flavor. Tassadar: Fixed an issue that could prevent Archon from refreshing Dimensional Shift’s cooldown. The Lost Vikings: Olaf will no longer Charge destroyed Structures. Valeera: Shift queuing movement commands followed by a Hearthstone or Mount command will no longer break Stealth before channeling begins. Valeera: Stitches’ Putrid Bile will no longer cause a red “revealed” icon to appear over Valeera’s nameplate while she is inside Smoke Bomb’s area of effect. Varian: The cooldown for Victory Rush will no longer be reduced when nearby enemy Structures are destroyed. Artanis: Allies will no longer hear Artanis’s death voiceover globally. Voiceover: Fixed an issue in which an excessive number of left-clicks were required in order to play certain Hero voiceover lines. Medivh: Will now play his Ready voiceover when locked in during draft selection. Kerrigan: Fixed an issue in which Essence for Essence would always follow the player’s global Quick Cast settings. Lunara: Changing Lunara's Skin selection during draft mode will now correctly update her draft portrait. Hero Select: Tyrande will now appear in the list of available Heroes when “Hearthstone” is used as a search term during Hero Select. Observer Mode: The Follow Player Camera hotkey (C) will now correctly follow the selected player while observing a match or watching a replay. Observer Mode: The Quick View Player hotkey (V) will now limit the Observer’s vision to the selected player as long as it is held down. Score Screen: Echoed Corruption’s Talent Quest will now correctly appear complete on the Talents tab at 40 stacks rather than 35.